Another eventful weekend and week passes by where a lot of our time has been spent outside, in the fresh air - just the way I like it! Summer is all about being in wide open spaces, and for me, having the sea breeze glide over and tousle my son's hair as he runs after his kite, or sand oozing though the gaps in his toes as he plays gleefully with his bucket and spade - yeah, it makes me fell good about my life right now; good to be here, un-rushed. So it was that on Sunday afternoon we found ourselves once again on the rocky path looking over the water separating us from the launchpad - helicopter spotting. Once again we waited patiently for a take off and/or landing, and once again there wasn't any. That's okay, we got to see one being re-fueled, getting put on a trolly and being pushed to another part of the heliport. That was the closest we got to a launch on Sunday. Kien was happy, he got to point and yell "hey tee ta" lots! The guys decided to check out the water, and brought back a nice sheet of seaweed. Jef took a bite out of it, but I didn’t fancy doing the same – not before thoroughly washing it at the very least. Our second attempt at kite flying for the weekend on Bastion point was a success. There was wind, lots and lots of wind. It is not only me that loves wide open spaces – this little guy cannot sit still. …before he started taking his hat off and running away from me, knowing full well that I’d be chasing him to put that hat back on. I love it up here on Bastion Point. The views are simply spectacular! It was a family affair at Hamilton Rd Beach Reserve on Tuesday. The sun filtered through the gaps in the tree canopy creating discs of dancing light on our blankets. 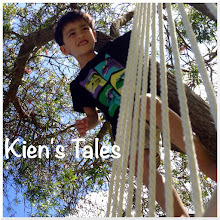 Kien did his usual and ran around making friends with strangers - that's when he's not just running around or climbing the stairs. Kien's cousin Thomas had a good time crawling around in the muddy sand. Then he was stripped and cleaned. Little Thomas will be turning one at the beginning of next month. It seems like time has gone by so quickly. What a lucky boy to have a Great Grandma. It was fun playing with Great Grandma's hat, which I am now the proud owner of. Thanks, Mum! You take the most beautiful pictures. I love the last one of Thomas, and the one of Kien running through the wide open spaces. Just noticed someone drew a black dot on Thomas' face in one of the hat pictures, haha! I've been so looking forward to summer, I just bought Thomas 5 pares of shorts, but it's too freezing cold to wear them. Thanks, Michelle. You've taken some pretty awesome shots yourself. Thanks for pointing out the dot. I've done that a few times when I've been editing pictures at 1am. Yes, definitely roll on summer, indeed! More beach outings, more picnics, yay.